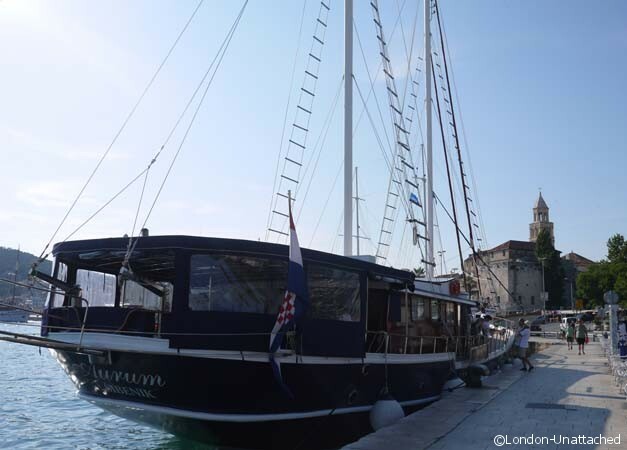 Split on the Dalmatian coast was the last place I visited on my recent trip to Croatia. 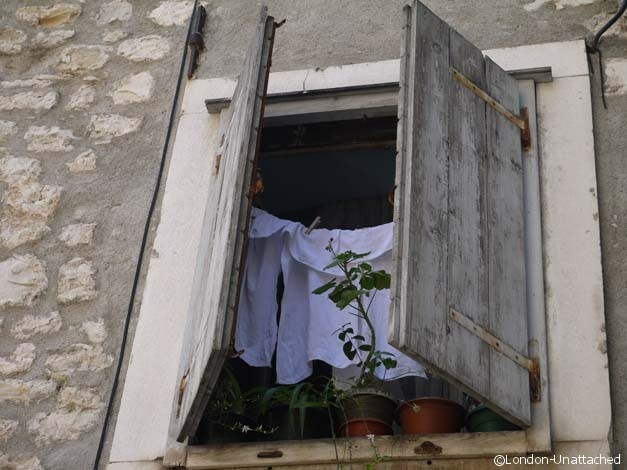 One of the most enjoyable challenges for me writing about Croatia has been that throughout the seven days I felt totally immersed in culture, history and gastronomy. I could probably write the same amount again and still have stories to tell. Split, somewhere I asked to visit, sounded interesting on paper. ‘Interesting’ though turned out to be far too insignificant a term. 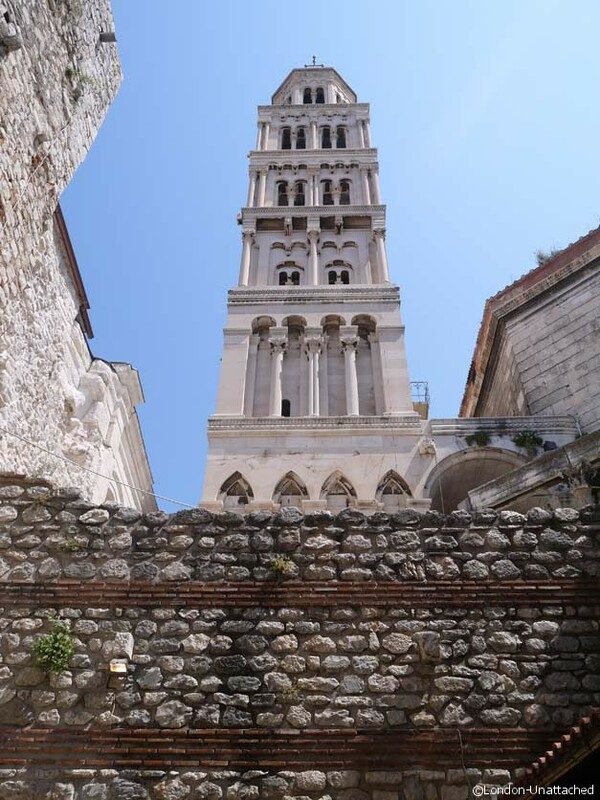 Split is unique both for its current day charm and for the historical significance of the City. I must admit that walking with Ana, my guide for the day, from the hotel to the historic City centre, for a moment I was less than certain. The beautiful Dalmatian coastline was packed with massive cruise liners and ferries. Traditional sailing boats made a welcome contrast to the sleek and modern sea-carriers but even they are destined to be used to entertain holiday makers. We’d seen a vast aquaduct as we drove into Split, still operational today it was originally constructed to provide fresh water for the Palace. For me, that typifies Split. Just as the aquaduct still supplies fresh water to the City, the infrastructure of what was originally constructed between 295 and 305 AD has become the foundation for a working community ever since. 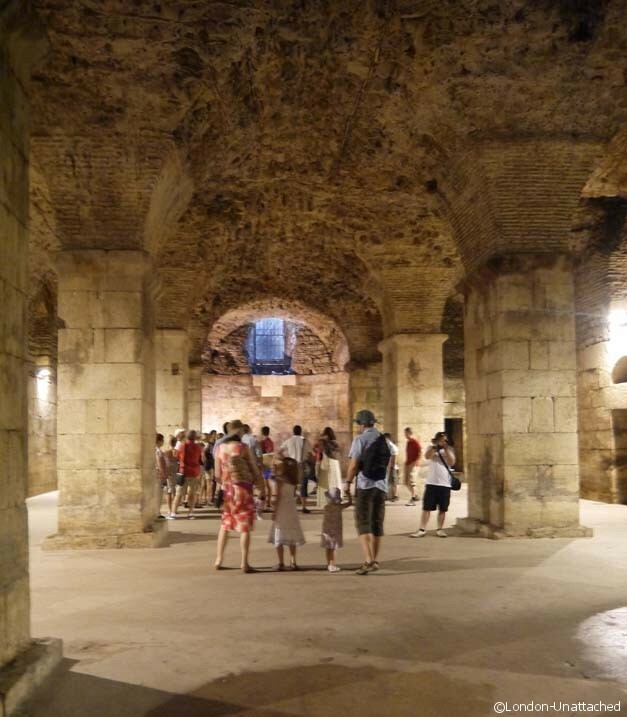 We approached the Palace and the City centre through the ‘brass gate’, on the sea front, and walked through a series of basement corridors and rooms which mirror the layout of the original palace rooms above. 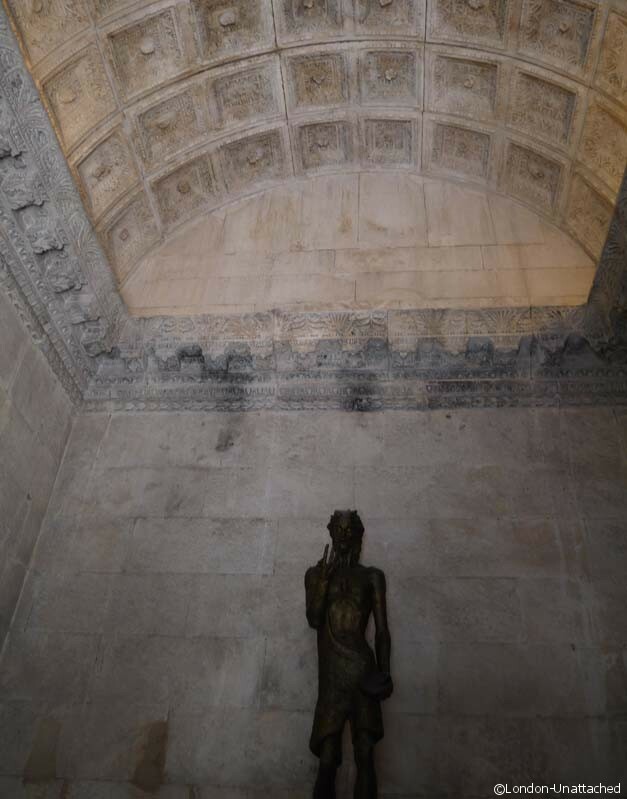 If you visit, look up and you’ll see round hatches in the ceiling. At one point they were the main way to dispose of rubbish from the living quarters above. Everything was piled through the hatches into the basement rooms. And, that is one reason why nothing changed at the basement level-it became one large rubbish dump so remodelling the rooms would have meant a major clear-up first! 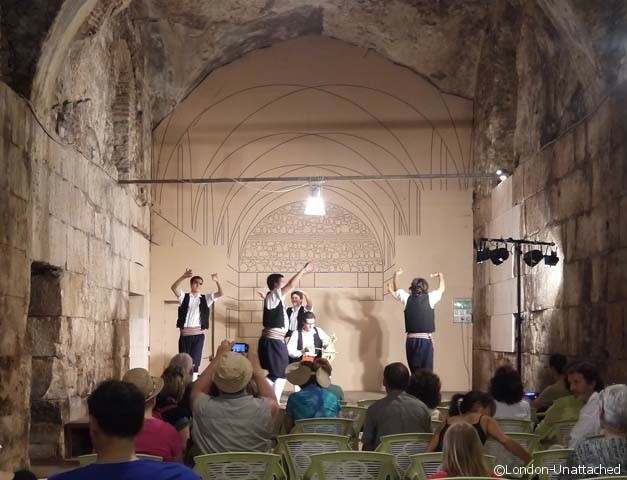 This route into the inner City takes you through market stalls and staged areas where you can often see traditional dancers and musicians performing. Touristy yes, but convincingly authentic and completely free of charge at least when I was there. Emerging into daylight, you find yourself looking out, just as the Emperor would have done, over a monumental courtyard lined with columns, called the peristyle. Of course you can stand and pretend to address your people (although I don’t believe there was an Empress of the Rome…). Or like me, you can just sit on the steps in the evening, drinking Grasavina and watching the live entertainment. 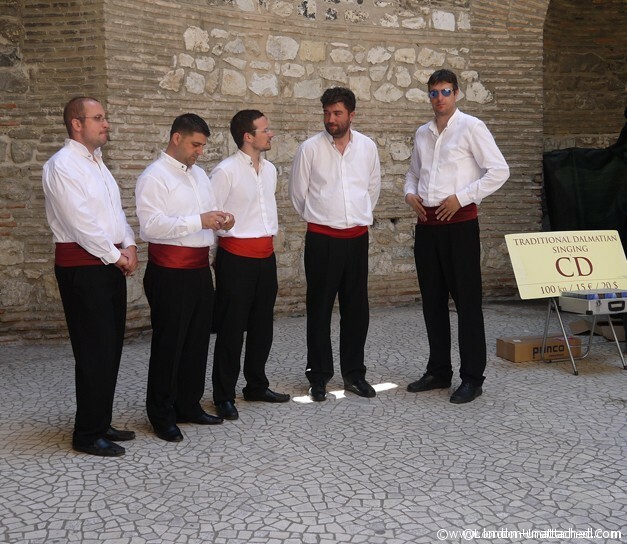 From Roman re-enactments to klapa and traditional dancing, there seems to be a constant stream of activity. It’s a vibrant space that for me, managed to escape feeling overly touristy perhaps simply because of its size or perhaps because my glass of Grasavina was less than a pound! 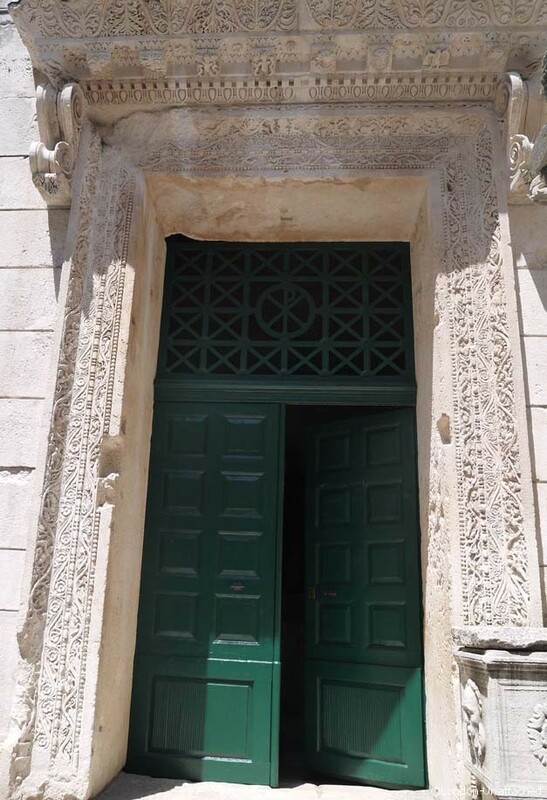 The Palace itself is built of white limestone and marble from the nearby island of Brac – the finest in the region. The Emperor was clearly also into upcycling, using granite columns that were brought over from his conquests in Egypt for example to build his new retirement home. To the right, of the peristyle you can see the Cathedral. It looks rather grand from the outside and has a beautiful bell tower similar in style to the one in Trogir. Inside, it is ornate and beautiful but probably the smallest Cathedral I’ve visited. Originally the Emperor’s Mausoleum it was converted into a Cathedral by early Christians and what has evolved is a curious mixture of the original Roman octagonal construction with thirteenth century pulpit and gateposts and ornate carved 13th century choir stalls. 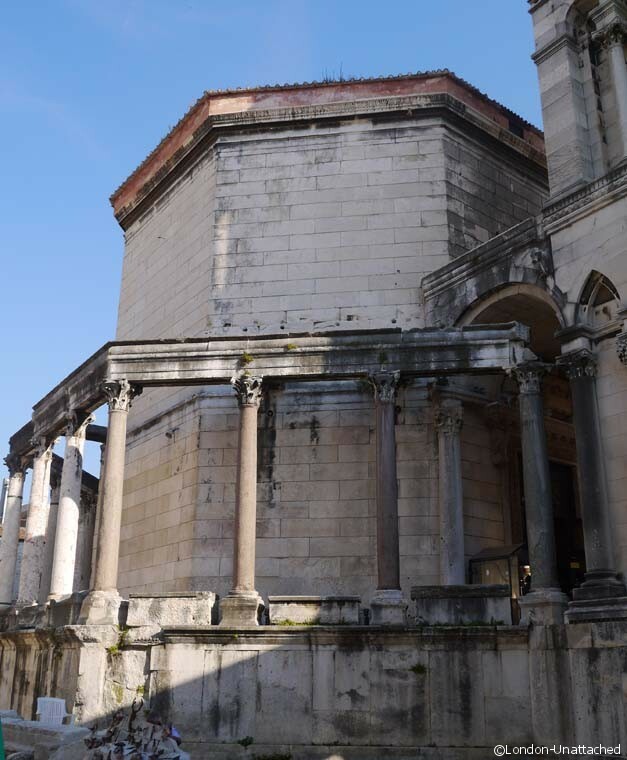 To the left, the Temple of Jupiter was transformed into a Christian baptistry in the middle ages. 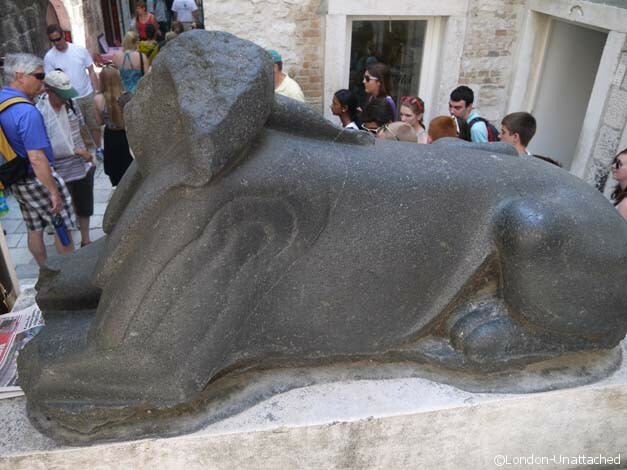 Outside the headless sphinx in black granite guarding the entrance was imported from Egypt at the time of the temple’s construction in the 5th century – originally the Palace was decorated with numerous granite sphinxes but today only three remain in Split. 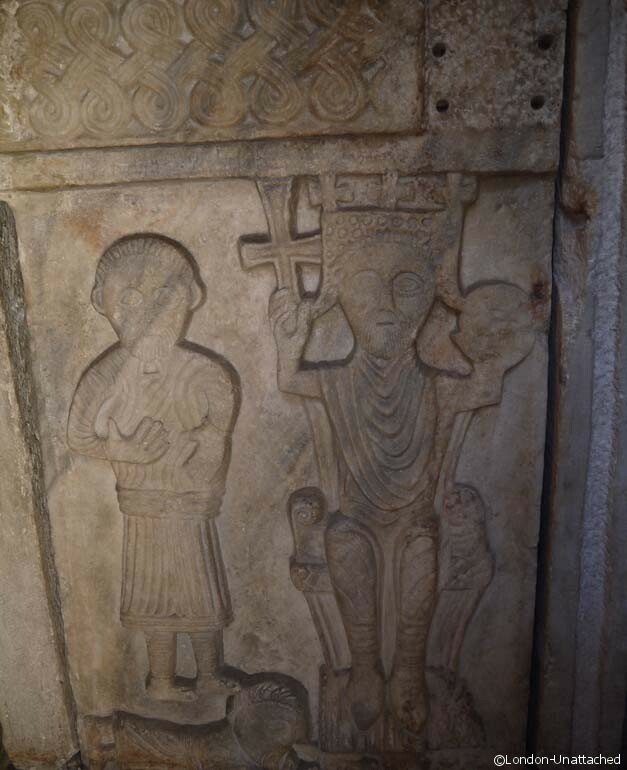 Inside, there’s a modern bronze, a fine baptismal font showing one of the early Croatian kings and a stunning barrel vaulted ceiling. One reason why the City has remained so well preserved is the sea front fortification of the original Palace which prevented the buildings being ransacked. 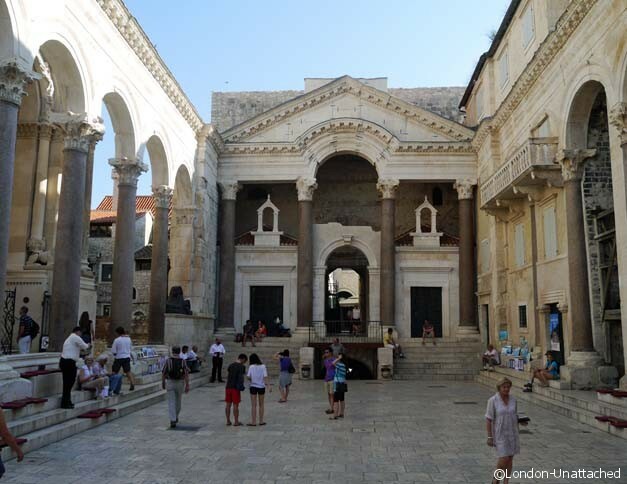 But, from the demise of Diocletian through to the 18th Century, Split was also relatively unknown in Western Europe. 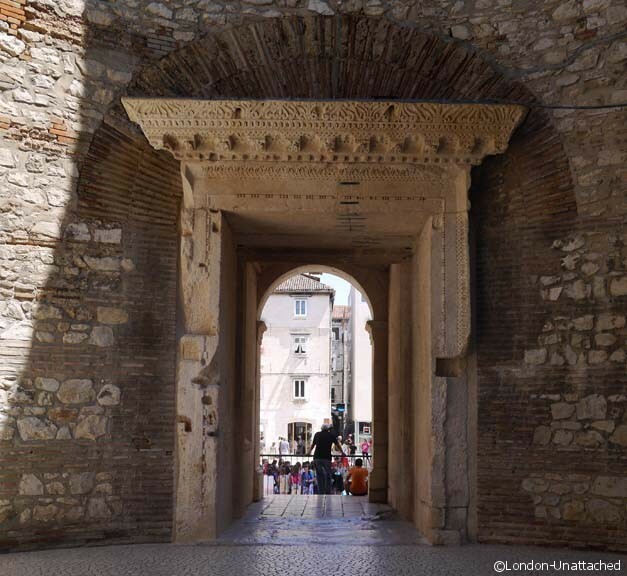 The City was ‘discovered’ by Scottish Architect Robert Adams who published published Ruins of the Palace of the Emperor Diocletian at Spalatro in Dalmatia (London, 1764). The Palace was a major inspiration for Adam’s style of Neoclassical architecture, which in turn influenced the design of much of post Revolutionary America, in an evolution of Neoclassicism known as federal style. Walking further into the town, we found more medieval buildings. Streets and alleyways, some unbelievably narrow lined with shuttered houses, washing hanging out in windows and across the road. In the early Middle Ages the City as it exists today started to be built within the palace. It was the commercial prosperity of the 13th and the 14th centuries which led to more building and the town spread outside the palace. And, in much in the same way, Split is still a living centre. Despite the wealth of historic buildings this City doesn’t feel like a museum. Thankfully Split seems to have managed to escape being completely consumed by the tourism that sustains the economy and instead has invested in areas where those who want to party can do so, while maintaining homes for locals and preserving the cultural heritage of the the Medieval and Roman buildings. It is a very special place that can manage to balance three very real economic needs so successfully. There is a lively, young nightlife in Split. My guide Ana told me that the people of Split loved to dress up and that the Dalmatian people as a whole were very fashion conscious and closer in style to Italians than the rest of the Country. Walking home after dinner on my first night in the town, it was obvious this was true. Split is somewhere to see and be seen. There are live bands and discos close the Riva, Split’s seafront promenade, which runs the full length of the City walls, and plenty of sea facing bars full of a twenty something crowd, out to party the night away. Then of course there’s the historical centre. 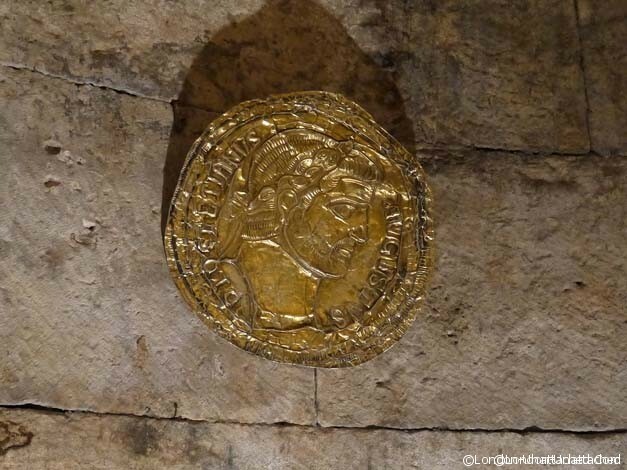 Amazing because of the level of preservation of everything from Roman rubbish chutes through to medieval houses. It is a listed Unesco World Heritage site with a wonderful mixture of quaint, splendid and incredible things to see. Finally, it’s a working City, with markets, shops and residential areas. The sea and sandy beach in June was full of locals. The markets had a real buzz to them and the City is clearly still owned by the people who live there and not by the seasonal tourist market, although at times the cruise ship tours do arrive like a tidal wave. And achieving that balance, for me, seems a little like a circus act feat. I hope this fascinating City never falls off its tightrope and continues to provide a real treat for such a diverse audience. With many thanks to Ana Vuletić for guiding me through Split and entertaining me for the day! 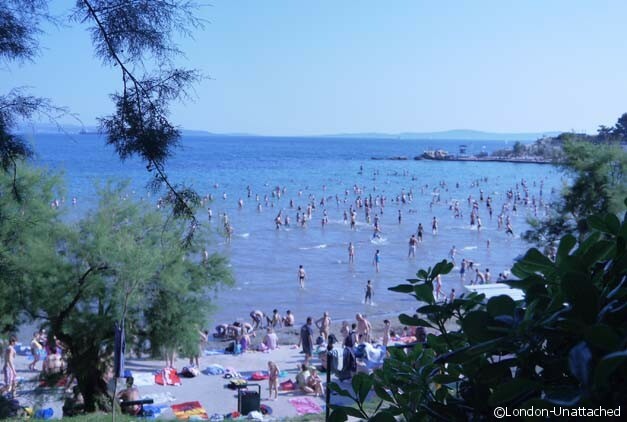 One of the most amazing things about Croatia is their pebble beaches (we just don’t have those in the US!) and the gorgeous water it creates…all those pretty greens and blues! Such beautiful architecture and culture – looks like you had a blast on your trip! It is an amazing place to visit. Highly recommended! 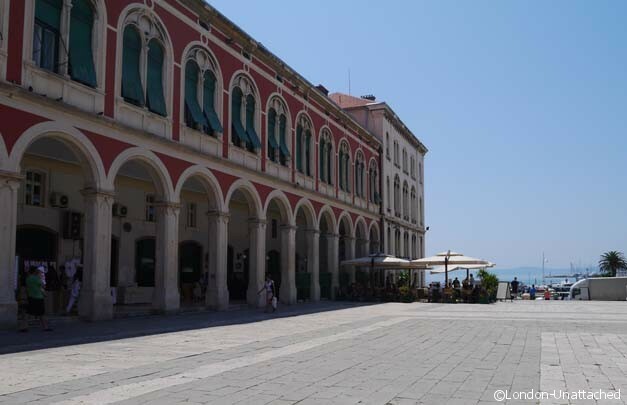 Fiona – thanks for the virtual tour of Split. It does seem to be quite a popular destination! Nice that you got to try a local wine – what did you think of it? Those alleyways are exceptionally narrow! All adding to the character of the place. Well documented! Perhaps I’ll retire there … after becoming a Roman emperor. Beautifully described and photographed! I love that you included the detail in regard to the Emperor “upcycling” columns claimed from Egypt! It’s amazing to think that they went to the extraordinary effort of transporting them in order to include them in this new palace. Thank you! I loved split. I think you would too, I haven’t covered the bars and food yet, but I will!